Often beaTunes is perceived as a tool strictly for EDM DJs. From years of support work, I can tell you that that is definitely not the case. Yes, EDM DJs like beaTunes. But so do runners, spinning instructors, and last but not least dance teachers. For dance teachers, BPM (beats per minute) is a very useful value to determine the tempo of a song. However, even more useful is MPM (measures per minute). Measures or bars per minute are the de facto indicator for tempo in the ballroom world. How many beats are in a measure is determined by the time signature or meter. Samba, Polka, and Paso Doble usually contain 2 beats per measure, Waltz 3 beats, and most other dances 4. 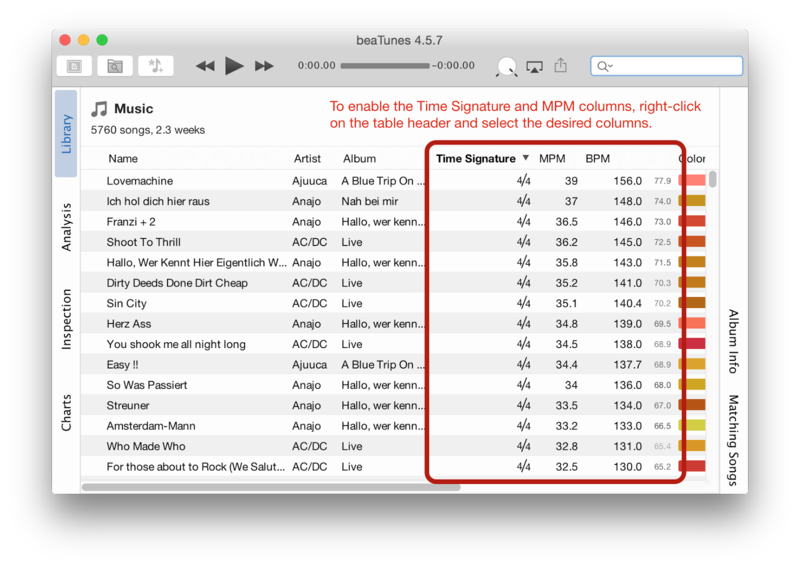 It's a little known fact that beaTunes has been offering an MPM column in its main table for many years. To enable it, just right-click on the table header and select MPM in the drop down menu. Alternatively, select a song, open the View menu and select View Options. A dialog box will then allow you to customize shown columns via drag and drop. Unfortunately, making the column visible does not fill it. But don't despair—in most cases that's easily done, as the MPM value is automatically calculated from the BPM value—as long as the Time Signature is set. First, to make the signature value visible, make sure to enable its column. This is done in exactly the same way as the MPM column. Then let beaTunes compute the BPM values (using the OnsetPeak algorithm). In this step, beaTunes may already fill in some Time Signature values—but be warned, the algorithm used in beaTunes 4.x isn't very accurate. You're probably much better off setting the time signature manually. To do so, click on the table header Genre to sort your library by genre. Then select e.g. all Waltz tracks and open the Get Info dialog (e.g. via right-click). Go to the BPM & Co tab and change the value to ¾-time (see screenshot, please forgive me the AC/DC cover in there…). Then continue with other genres. Hopefully, this helps you taking advantage of beaTunes even more, when preparing your next ballroom dance class or competition. 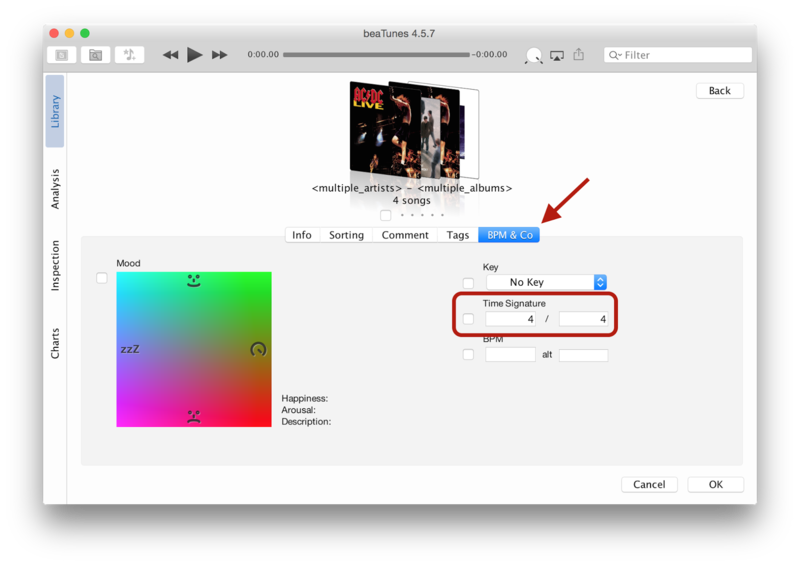 Starting with beaTunes 4.5.8, time signature detection has been improved. See here for details.